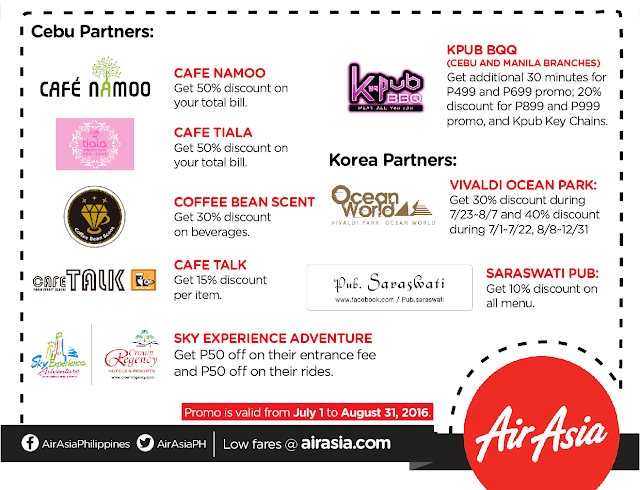 Home / AirAsia / Korea / Philippines / Promos / Travel / Extend your summer in Korea via AirAsia! Extend your summer in Korea via AirAsia! AirAsia, the World Best Low Cost Carrier by Skytrax for seven consecutive years, is offering flights from Cebu to Incheon (Seoul) from as low as Php5,720 all-in. Booking period is from June 27 to July 3 with travel period from June 28 to Oct. 29,2016. Philippines AIRASIA CEO Joy Caneba said, “We're painting Cebu skies red with AirAsia's exciting promo fares to Seoul in Korea. Cebuano travelers may now extend their summer vacation in Korea to relax, eat, shop, and be part of the annual mud festival." 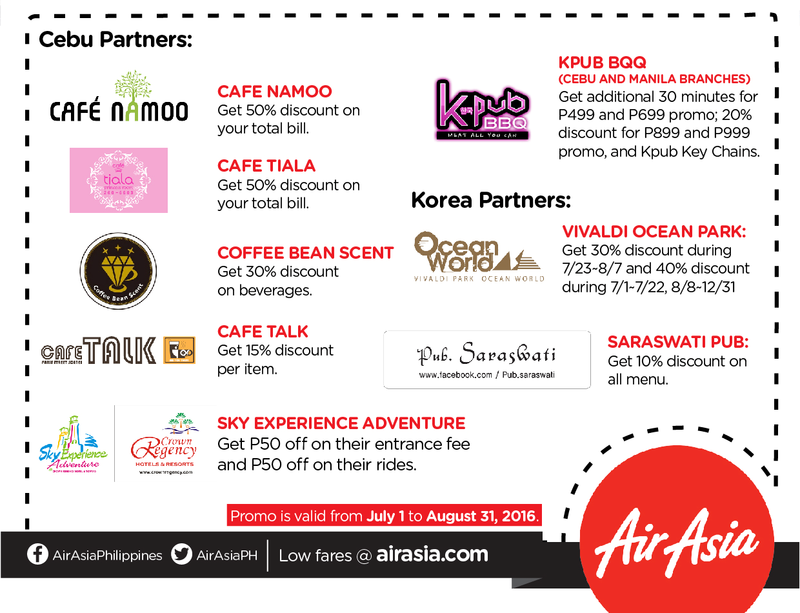 And to fully enjoy your summer in Korea, Philippines AirAsia passengers may avail of up to 50% discounts from the airline’s partners starting July 1 to August 31, 2016 in Cebu and Korea by simply presenting their boarding passes or e-tickets for flights to/from Cebu and Incheon to AirAsia’s partner establishments, namely Café Namoo, Café Tiala, Coffee Bean Scent, Café Talk, Sky Experience Adventure, KPub BBQ, Vivaldi Ocean Park and Saraswati Pub. The fun doesn’t end there! The month of July is one of the best times of the year to travel to South Korea, where millions of visitors and tourists gather for the annual Boryeong Mud Festival in Daechon Beach. The 2016 Boryeong Mud Festival will be held on July 15-24 but the main celebration is on the 16th when visitors will have the luxury of wallowing themselves in the mud as well as learn about mud as a cosmetic. Other features in the Mud Festival that has become a global event since it started in 1998 include mud wrestling, mud sliding, and a mud king contest. Find out for yourself! Keep updated with AirAsia’s latest promotion and activities via twitter (@AirAsiaPH), Facebook (www.facebook.com/AirAsiaPhilippines), Instagram (@AirAsiaPh), and on Viber public chat (@AirAsiaPh). Book your flights from Cebu to Incheon (Seoul) at www.airasia.com or visit a travel agent near you!